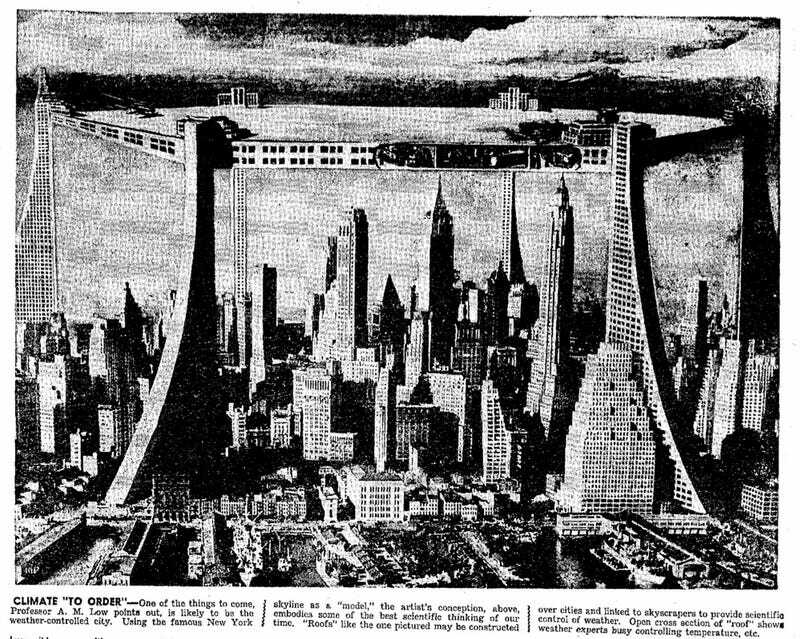 This illustration from the August 28, 1949 San Antonio Light (San Antonio, TX) depicts the future New York City skyline. The picture accompanies an article from Prof. A. M. Low, which we'll take a look at in the coming weeks. CLIMATE "TO ORDER" — One of the things to come, Professor A. M. Low points out, is likely to be the weather-controlled city. Using the famous New York skyline as a "model," the artist's conception, above, embodies some of the best scientific thinking of our time. "Roofs" like the one pictured may be constructed over cities and linked to skyscrapers to provide scientific control of weather. Open cross section of "roof" shows weather experts busy controlling temperature, etc.